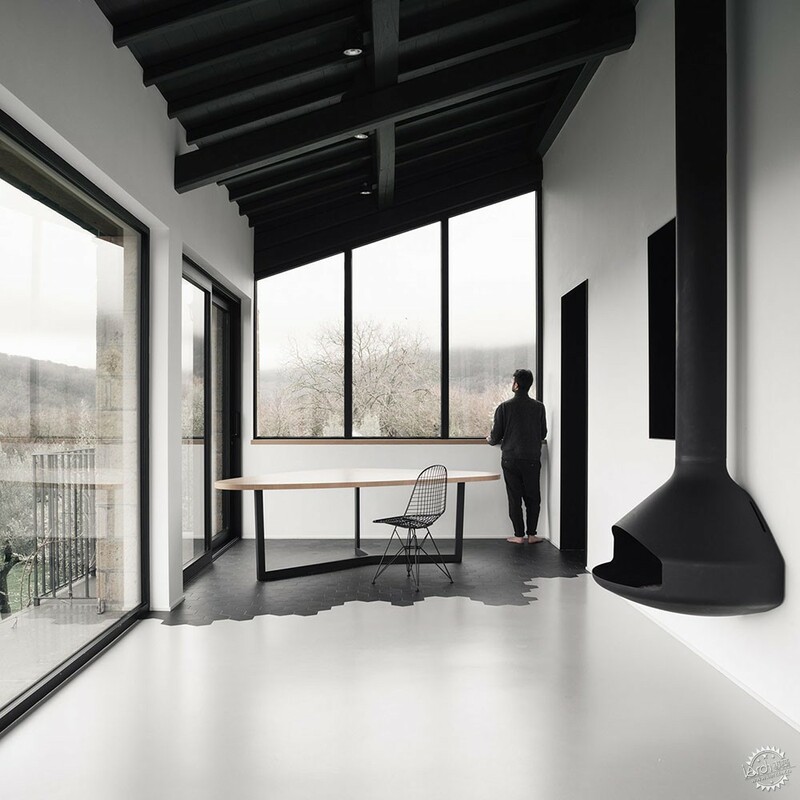 Architecture office Deltastudio used a palette of monochrome materials to create light-filled rooms with views of the surrounding countryside at this modernised farmhouse near the Italian town of Caprarola. Local practice Deltastudio oversaw the conversion of the traditional farmhouse into a contemporary home for a family who left the city to begin a new life in the countryside. The client, Martina, and her family operate the farm from the house, which was renovated and expanded to make it suitable for modern living. 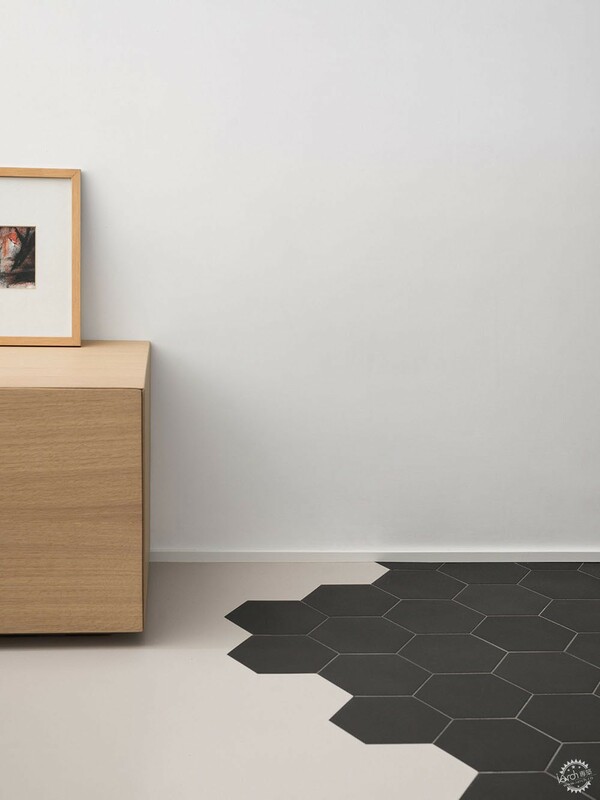 A series of compact spaces are tailored to the needs of its users and are designed to provide a pared-back, neutral backdrop to enhance the views of the landscape. 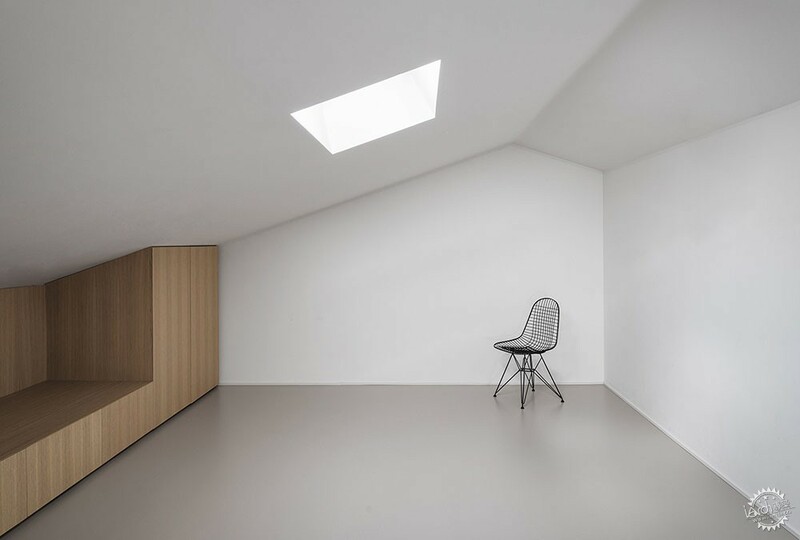 "The old farmhouse is renewed, expands, becomes a home, becomes a refuge," said the studio. 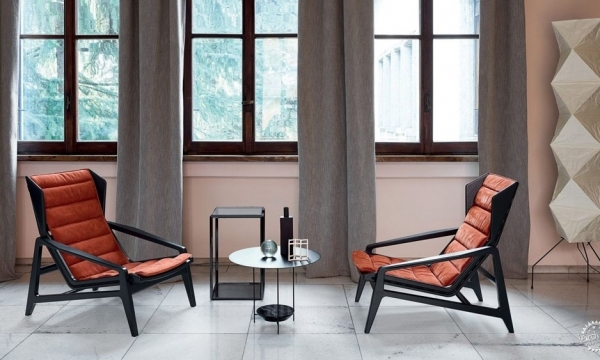 "Simple and compact, it accepts the needs of a modern life in close contact with nature." The building is separated internally into three distinct bands. The first of these is a new section added to the south side of the house that accommodates the main living areas. 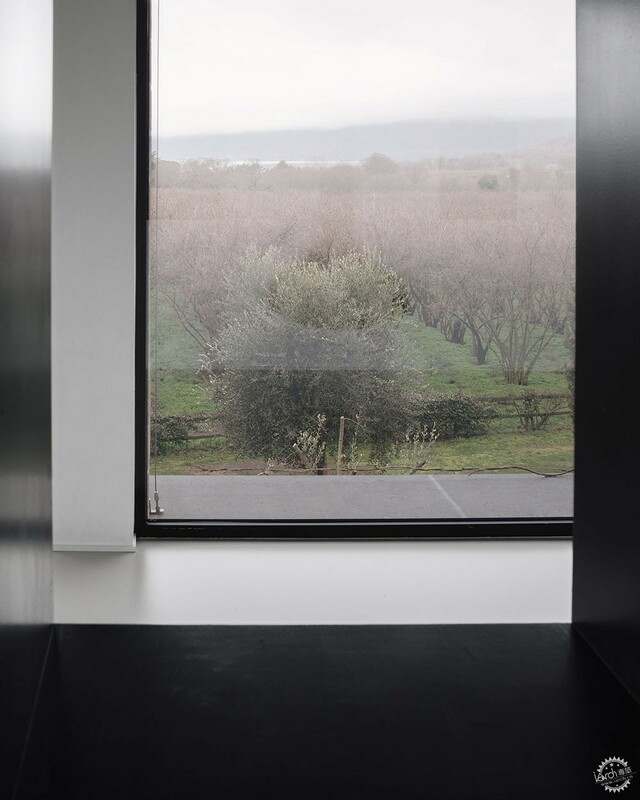 Large windows lining the living and dining space provide a panoramic view across the fields towards a nearby lake, while sliding glazed doors open the room up to the outdoors. 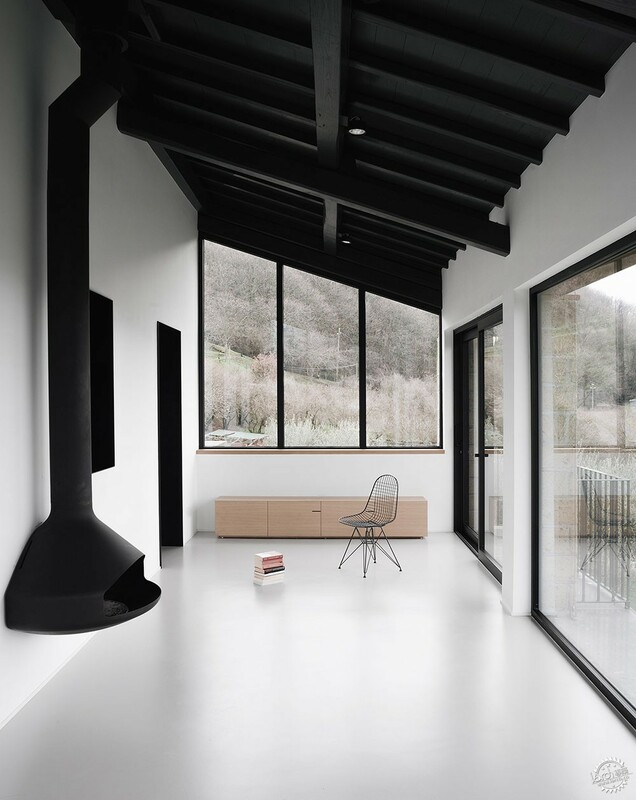 The living room is enclosed on one side by the original outer wall, which is now punctured by black-framed openings that ensure natural light flooding in through the windows reaches the kitchen in the central band. 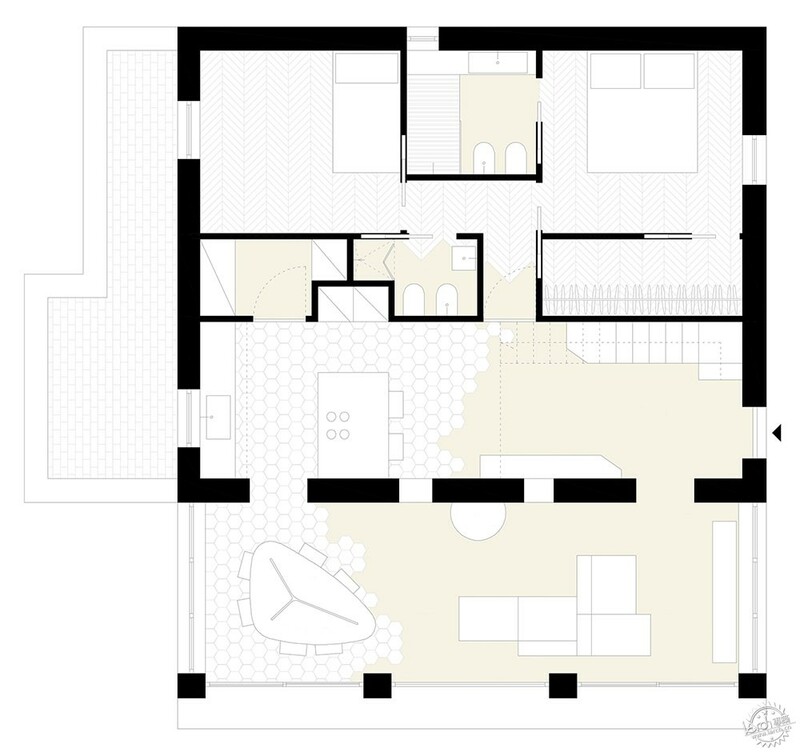 On the other side of this space is a service core containing a pantry, washroom and a closet for the master bedroom, which is situated in the third band to the north of the house, along with another bedroom. 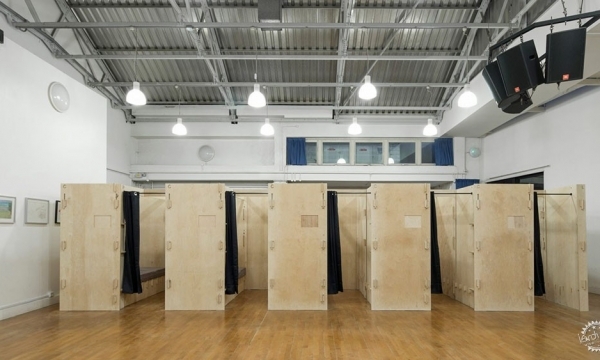 The building's entrance area is situated in a double-height space next to the kitchen. 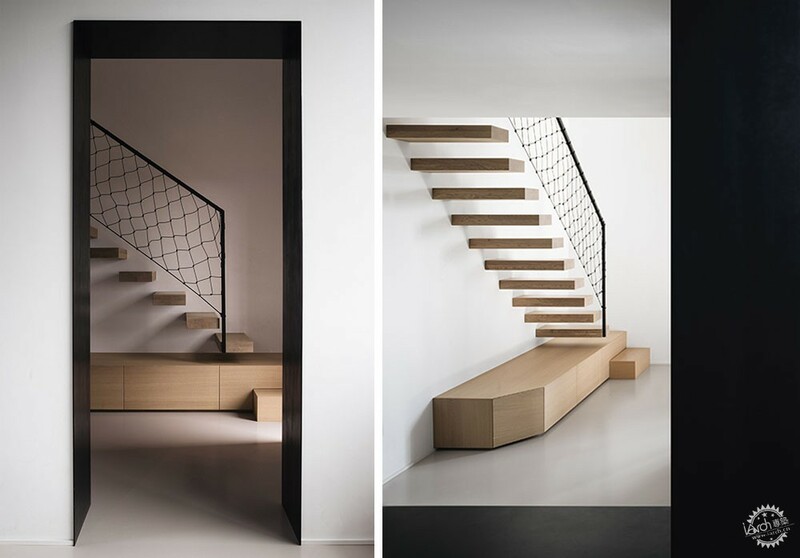 It contains built-in wooden benches and a staircase featuring cantilevered treads and a minimal net balustrade. The staircase ascends to an upper floor containing a study, a large bedroom for the owners' two girls, and a bathroom. 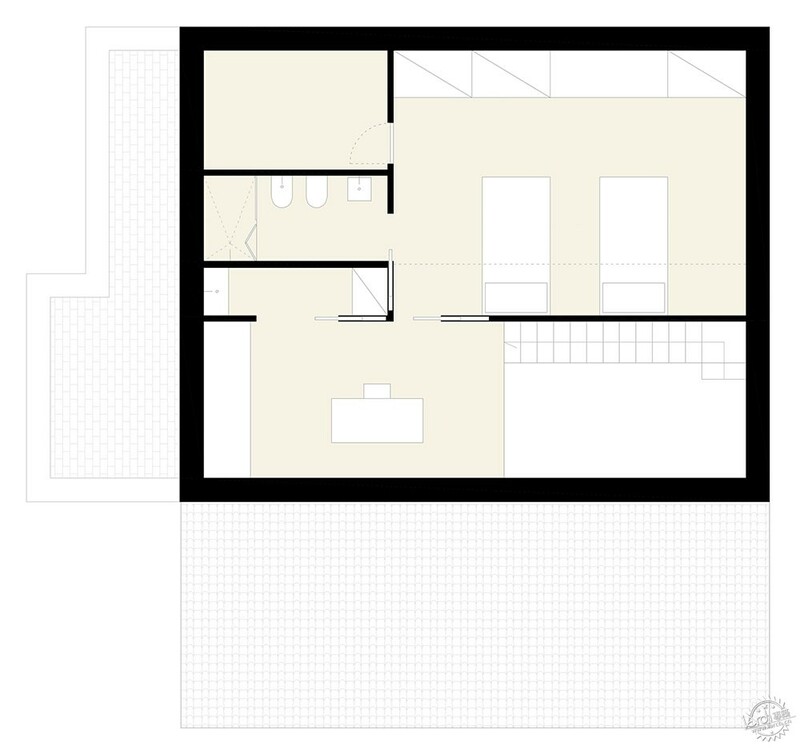 The bedroom on this level features a skylight and built-in storage with a seating nook beneath the sloping eaves. 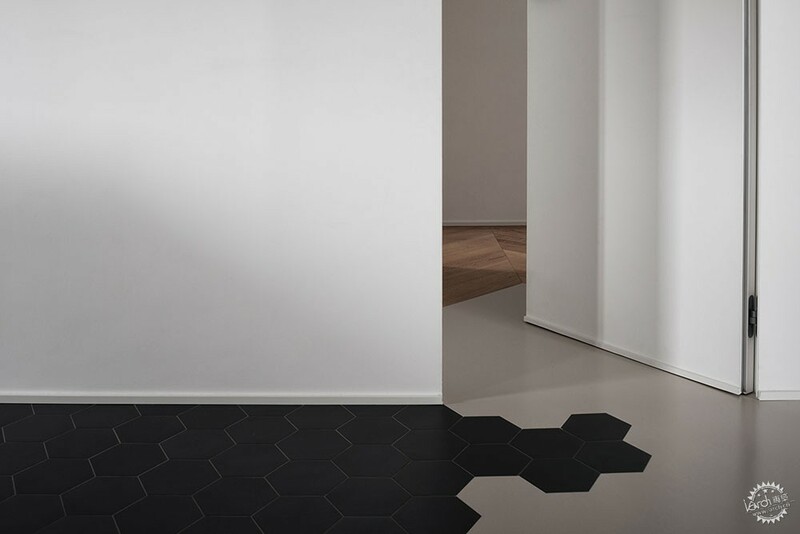 Throughout the house, a focus on the junctions of materials and contrasts of tone are used to define the different functional zones and the create a striking visual contrast between juxtaposing surfaces. 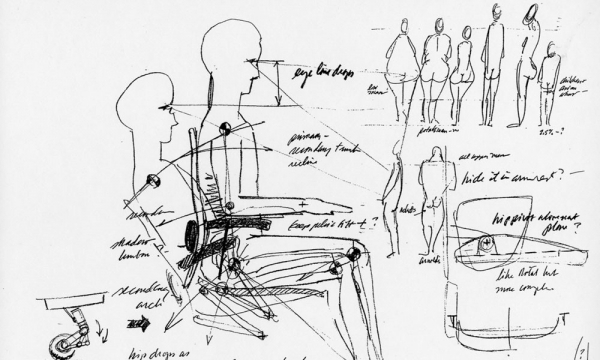 "The interior becomes essential," said the architects. "Materials and colours interact with the external landscape, which penetrates into the rooms as a manifesto of what pushed the owners to leave the city." 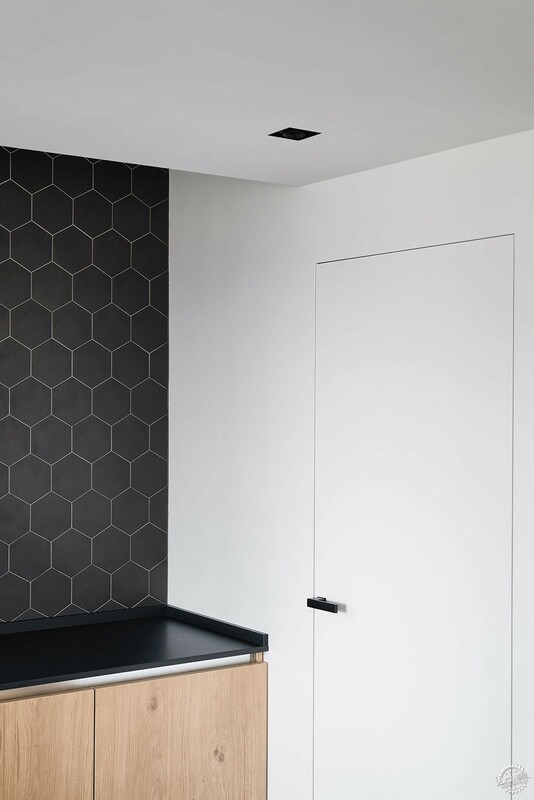 The flooring of the entrance level transitions from poured cement to black hexagonal tiles that extend out from the kitchen and through to the dining area. 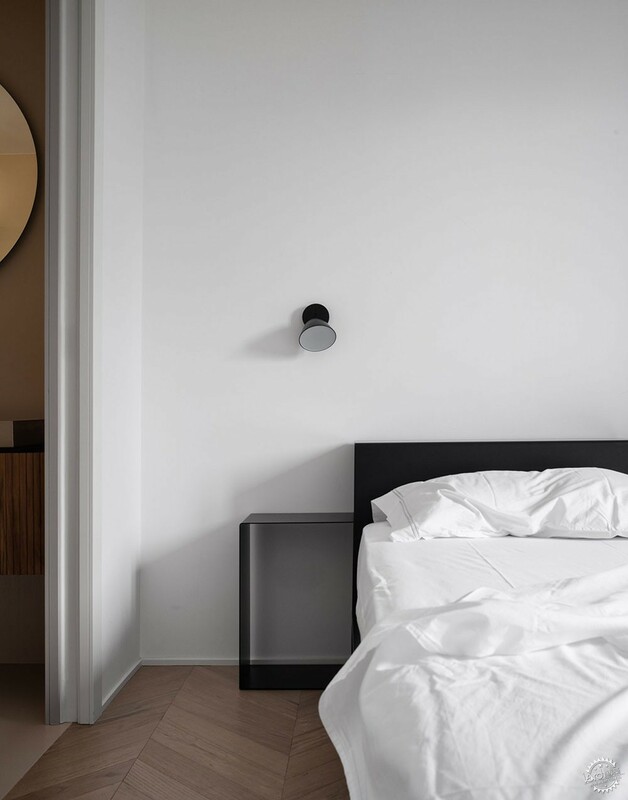 The bedrooms feature wooden parquet and have a calming simplicity intended to evoke the almost monastic existence of the peasants and farmers who traditionally occupied this region. 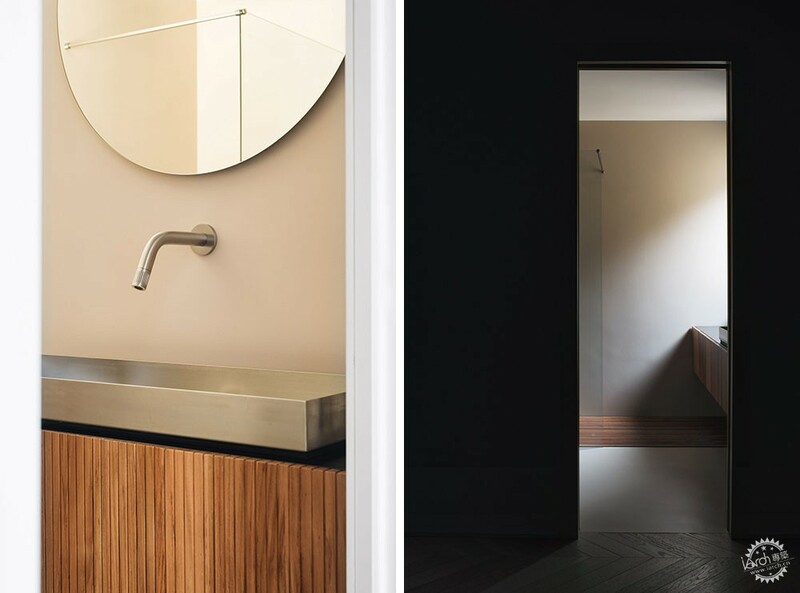 Timber joinery used throughout the interior introduces a warm tone and texture to the otherwise monochrome scheme, creating a tactile connection to the surrounding nature.